"Definitely a hit for Halloween!" Beat white sugar and 3/4 cup butter together in a bowl using an electric mixer until smooth and creamy; add eggs, 1 at a time, beating well after each addition. Beat pumpkin into creamed butter mixture. Mix flour, pumpkin pie spice, 1 tablespoon cinnamon, baking powder, and ginger together in a bowl; stir into creamed butter mixture, alternating with buttermilk, until batter is smooth. Fill each muffin cup 3/4-full with batter. Bake in the preheated oven until a toothpick inserted in the center of a cupcake comes out clean, 20 to 25 minutes. Cool in muffin tin for 10 minutes before transferring to wire rack. Beat cream cheese and 1/2 cup butter together in a bowl using an electric mixer until fluffy. Beat confectioners' sugar, 2 teaspoons cinnamon, and vanilla extract into creamed butter until frosting is smooth. Spread frosting on each cupcake. 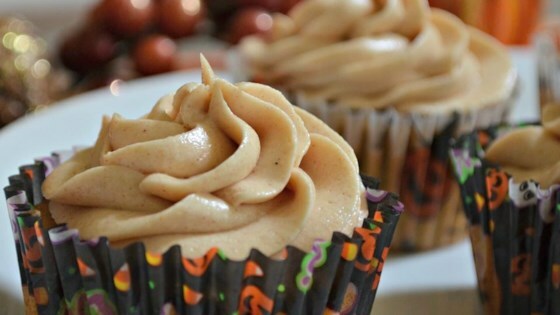 These delicious cupcakes make any fall occasion special. Frosting was wonderful but cake was not worth the effort. This review is for the frosting only. Very good as written. Did not change a thing and it was very yummy. Will use again. I love it! After I took them out they started to fall, but they are still yummy. They are very moist and I could taste the pumpkin very well. Overall they were pretty good. I wasn't a fan of the cupcake. All I kept tasting was the sugar in my mouth.